Photographers are always looking for new ideas, equipment, and solutions. 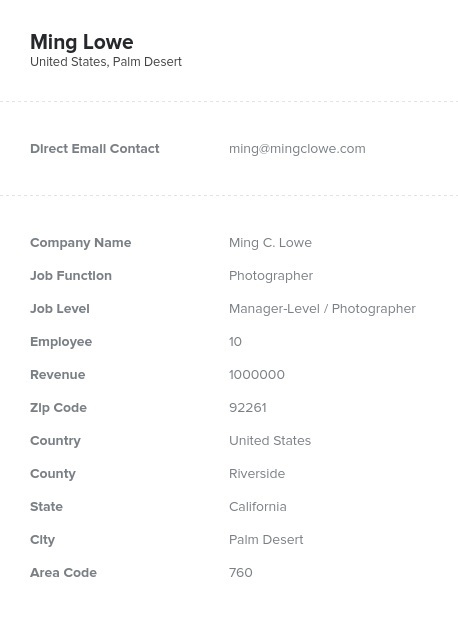 With this human-verified photographer email database, you can establish the types of relationships with photographers that you need to grow revenue. Let our photographer email list be your marketing secret weapon. Photographers are artists who know the importance of staying up to date on the latest equipment and techniques. Whether your company makes camera equipment, accessories, or even basics like rewritable DVDs or printer paper, focus your marketing efforts on your target audience with this premium photographer mailing list. Our photographer email database is regularly verified to ensure that it is accurate, so you won't waste time sending messages that will just bounce back. Whether your target audience is wedding photographers, freelance photojournalists, or those employed at portrait studios, this photographer email database will give you the advantage you need to stay ahead of the competition. And because we understand that servicing the photography industry means being versatile and flexible, much like your customers, we also provide a list-building tool that you can use to create a targeted photographer mailing list that fits your specific needs. When you buy a photographer email database from Bookyourdata.com, you are getting a premium list of high-quality sales leads that will help you to grow your revenue and establish strong business contacts. From email leads to phone numbers to postal addresses and more, we have the details you need to shoot your marketing materials over to photographers across the country!